St. Kilda is a remote and uninhabited archipelago in Scotland's Outer Hebrides, renowned as seabird breeding station and for its past human occupation in extreme conditions. Over 1 million sea birds use the islands. The world's largest colony of Northern Gannets, totalling 30,000 pairs, amount to 24 percent of the global population. There are 49,000 breeding pairs of Leach's Petrels, up to 90 percent of the European population; 136,000 pairs of Atlantic Puffins and 67,000 Northern Fulmar pairs. The volcanic origins produced a dramatic landscape of exceptional cliffs and underwater scenery. The islands were occupied by humans for some 2,000 years. Its inhabitants relied on bird products and keeping of sheep. The remains of 4 settlements are left, the structures dating mostly to the 19th century. The last remaining people asked to be evacuated in 1930 due to a lack of resources to survive on. The previous reviews cover the 2 main ways of visiting St Kilda (Beyond having your own yacht!) – a day trip from Lewis and a longer (often c 1 week) small boat cruise of the area. In addition, however, there are a number of “Expedition Cruise” boats which take in the Islands as part of a larger (2 week) tour of UK islands or of the North Atlantic/Sub Arctic. We visited on one of the latter having set off the previous evening from Oban en route to Greenland. On arrival we were lucky to find a NW wind which left Village Bay reasonably well protected – our Zodiac landings at the little concrete pier were a bit bumpy but a planned cruise through the small gap between the islands of Hirta and Dun wasn’t possible with large Atlantic waves crashing through. The risk of not being able to land at St Kilda is high – the summer season day trips are scheduled on alternate days to provide a cushion against bad weather and you need to allow for delayed departures in your plans. 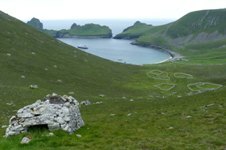 We spent around 4 hours on the main island of Hirta – enough time to explore the village and other remains of human settlement going back possibly to Neolithic times (including the unique “cleat” structures – photo), visit the museum and climb up to the highest point at Mullach Mor. We heard (but unfortunately didn’t manage to see) the “St Kilda Wren” subspecies. The equally unique “St Kilda Field Mouse” remained totally unnoticed! Soay sheep (“believed to be a survivor of the earliest domesticated sheep kept in northern Europe, and …. physically similar to the wild ancestors of domestic sheep, the Mediterranean mouflon and the horned urial sheep of Central Asia” Wiki) were, however, much in evidence. The buildings of the military radar base below the largely ruined village were somewhat larger than I had expected. They created something of a visual mess which could have created problems with inscription but ICOMOS dismissed them as making “relatively little impact on the landscape”. In fact continued military “occupation” is of great importance to the preservation of the island – without its infrastructure the Scottish National Trust would find it very difficult to maintain its current role. It is perhaps worth noting that St Kilda was originally inscribed in 1986 solely on 2 natural criteria (iii + iv) – despite the ICOMOS evaluation of that year concluding that it should also be inscribed on the basis of cultural criterion v (Quite why this didn’t happen is not really made clear in the minutes of the WHC). It then took until 2005 for cultural aspects to be added – with a deferral on these matters in 2004 at the same time as the site was increased in size with the inclusion of a massive marine area and the addition of a further natural criterion. We found the cultural aspects of interest partly for their intrinsic value but also because they brought to life those grainy black and white movies and stills of the final years and evacuation! Our visit to Hirta was followed by a fine cruise (on our main vessel) around the stacs of Boreray a few miles to the NE - I don’t know if the standard “day trips” take it in. Stac an Armin is the highest stac in the British Isles, the location of enormous colonies of sea birds (including the largest gannet colony in the world) and the location of the killing of the last Great Auk in Great Britain. Boreray itself is the smallest UK island with a summit over 1000ft. Our captain gave us an exciting “figure of 8” trip through the small gaps between island and stacs with thousands of birds wheeling above us and waves crashing into the cliffs and sea caves around us. Bearing mind the original inscription criteria it would have been a shame to miss this “natural show” – but it too linked to the Cultural landscape since villagers used to climb those same stacs for birds, down and eggs. Amazing! St. Kilda is easily in my top three WHS! What a truly amazing place. Planning for the trip took some time, as indeed did getting there. We visited Easter 2009 and had booked passage on the first boat trip of the year. We gave ourselves a 4 day window to make the journey - in the end we had to extend our stay on the Outer Hebrides to make the trip due to poor weather. The trip out and back is an experience in itself. The approach to the islands reminded me of the Skellig islands WHS in Ireland. We had around 5 hours on St. Kilda followed by a cruise around some of the smaller islands. The Natural Trust for Scotland guide on site meets visitors at the quay for a H&S briefing. They also man a small shop and post office where you can get a St. Kilda post mark and send mail via the weekly helicopter. The village is quite special and the views from the peaks are amazing. There was plenty of wildlife and it was lambing season when we visited. Four of the houses have been refurbished; one is now an excellent museum. St. Kilda is a little spoilt by the ugly military instillations unfortunately. St. Kilda was certainly my most expensive WHS visited, however the trip was well worth all the effort and I would go back again in a heartbeat. Planning for my journey started the previous year following a visit to the Isles of Lewis and Harris for the first time. I stayed at Cairisiadar with Jessie Buchanan in an excellent bed & breakfast overlooking Loch Roag on the west coast of Lewis. Here I met a lady who was I believe in her 70’s who had travelled from Aberdeen and on her way to St.Kilda. Until then I hadn't even heard of this place! She kindly left me a leaflet " Cruising with the MV Cuma". The weather had not been too kind of late but the day that she was leaving for St.Kilda cleared with sunshine late in the day but with a near gale force wind blowing. I remember seeing the MV Cuma leave and cruise across West Loch Roag heading for the open sea – I took one photograph. At the time I did not think too much about actually going to this remote island but as time went on I became fascinated with the story and struggle of St.Kilda as have so many other people. I read up about the islands, bought books, searched the internet and sought out articles and especially photographs. I decided that I wanted to go on this "adventure" and booked with Murdo for a trip in June – 6 days in total staying on the Cuma. I had never previously travelled in a boat other than a scenic trip for a few hours let alone across the atlantic. The day finally came and I had travelled up from London and stayed once again with Jessie. There were problems with the boat and I must say I wondered whether I would actually get to go at one time. However Murdo and the Engineer worked constantly to deal with the problem. I went to Stornoway on the Saturday where I met Murdo and my fellow passengers. Satomi and Hiromi had travelled from Japan, Sabine and Euan from Scotland and Ian from Bristol.The last leg of their journey was via ferry from Ullapool. Belongings collected we headed back to the Cuma with a stop en-route at the Callanais Standing Stone circles on a grey overcast Saturday afternoon. At the MV CUMA we stowed away our belongings and explored our new home to be for the next 6 days and nights.Leaving Loch Roag on a miserable Saturday afternoon on the 10th of June, Murdo had decided to make for Scarp initially as the weather report was not promising at all. As we made open sea at Gallan Head the conditions deteriorated considerably and I then realised the futility of sea-sickness pills!! I can only describe being at sea in those conditions as the worst "roller coaster" that I had ever been on. It was impossible to walk in a straight line and one staggered from one part of the boat to the next hanging on wherever one could. Murdo was joined by Tabby and Kathy behind the wheel – the best place to be apparently as you can see what’s going on and focus on the sea and horizon. Waves crashed over the bow and on to the deck.The view from the stern was one of trough’s and peaks sometimes sinking so low that only sea was visibly even though we were only a short distance from land but always being tossed to and fro like a cork. We hugged the coast passing Mealasta Island in torrential rain and made our way south. As we neared Scarp and headed inland the sea became calm once more and we anchored off Scarp in the sound between Scarp and Kearstay. The storm abated and the sun shone and the evening was spent in calm conditions. Several waterfalls were visible on Scarp’s northern shores together with one small and deserted white sandy beach. I remember thinking that the days event’s had been a bit of an "eye opener" and I wondered what was in store if we made the real crossing in open seas to St.Kilda – at that time the forecast was still uncertain. Even the first night’s sleep was unusual with the gentle continuous rocking motion of the boat unsettling in my cabin directly underneath the fore-deck. The next day ( Sunday) broke to a sunny start and I listened to the forecast – which was not too promising - with Murdo – "I think everyone wants to get to St.Kilda this trip – let’s go for it!" he said. This was it, we were finally on our way. We raised anchor and headed for open sea. The conditions were already worsening as we left safe anchorage off Scarp. As we hit open sea the conditions changed rapidly over about 50 yards – gone was the smooth surface replaced by angry sea’s – Murdo described the crossing conditions later as " in confused seas"!! The actual crossing I will keep brief – the previous day was a picnic – I managed 45 minutes up top and then succumbed to my one and only bout of extreme sea-sickness ever. I spent the rest of the journey ( despite the sea-sickness pills) in my cabin being thrown sideways and vertically and a combination of both for the next 4 hours – time seemed to stop still and the journey took what seemed to be an eternity with every minute passing one by one. I drifted in and out of some sort of sleep brought on by the fatigue of the illness. The next I knew was a knock at the door and Tabby told me " we have arrived". I gathered my camera equipment together and in a very weak and tired state made my way up on deck. I was greeted by sunshine and a marvelous view upwards of Boreray with the late afternoon sun silhouetting the sheer cliffs. The sound of the birds – too many to count was staggering…. I had finally arrived. Murdo guided us between the Stac’s – An Armin and Lee were a wondrous site rising sheer out of the ocean – the MV Cuma seemed tiny and insignificant in comparison bobbing about near these treacherous outcrops. The boat was still pitching in the swell and one could actually feel the very essence of this most remote place on earth and imagine the St.Kildans desperately trying to fowl off these outcrops to provide for their families back on Hirta some 3 miles away, whilst surviving the harsh conditions that prevailed for most of the year. Even the journey in an open rowing boat would have taken immense effort in those days. I took many photographs in the short time available but found it extremely difficult to compose the images in the heavy swell that prevailed – they tended to be snaps rather than my usual time consuming composures to get the shot just right. Pressing on, the MV CUMA headed for Hirta and we sailed around the dun and headed into Village Bay. The village came slowly into view as we rounded the sheer black cliffs of the point of dun, with what appeared to be hundreds of cleits on the hillsides. These were a stone beehive bothy, water-tight but cross-ventilated - mainly used as larders for storing the sea-birds which were the St Kildans' staple diet, but they were also used as general stores for fishing tackle, ropes, etc., scattered across the hillsides. As we anchored in the bay a gentle, calmer landscape greeted us sweeping from the Dun, Ruaival, Conachair around to Oiseval. The protection afforded to shipping during storms by the dun was now clear. The cameras clicked from all in the party focused on views of the village and the surrounding hills. The only eyesore as far as I am concerned are the grey army camp buildings located near to the landing pier – they detract immensely from the overall appearance of the village environment. How they got "planning permission" in the first place I don’t know!! Village Bay is however an impressive example of a stone-age culture. Having finally arrived safe and sound now was the time to disembark from CUMA and finally set foot on Hirta – this task with a sound motor powered dinghy was no doubt far easier and safer that in the perilous days of by-gone years. Even so one could appreciate the difficulties as we jumped from the dingy on to slippery concrete coated with wet seaweed and green slime!! Walking on dry land was rather odd – having been on the CUMA all day in "confused seas" walking on land once again was another experience to which to adapt. I had never experienced "land sickness" before but this time it was purely a "balancing" type of deficiency which I am pleased to say my body soon adapted to. Murdo introduced the group to the Warden – Andy who explained the "rules" to be followed and gave "sound advice" so that we could enjoy our time on Hirta safely. "Don’t wear waterproof trousers – if you slip on the wet grass at the top of the hills you will just keep going". There had been a fatality the previous year where someone had walked from the village past the manse along the village bay side of Oiseval – as the ground became more steep and more and more slippery….. well, the rest is history. ( In fact , Ian had a minor slip and ended up in the expert hands of the "hirta" nurse with a some what swollen ankle later on the Wednesday - I later found out from Ian that a bone had been broken and his ankle required plaster back on the mainland - he was on crutches for about a month!! ) We then wandered up to the village and through the main street. Through the village ruins wandered primitive Soay sheep untidily shedding their umber-coloured fleeces leaving large clumps on the decaying stone structures to be found throughout the village. I wandered up through the village path past the restored buildings and the lone empty NTS wheelbarrow and the museum until I arrived at the village graveyard – a lonely desolate place littered with many natural "rock" gravestones covered in lichen. The weather had deteriorated to a drizzle and a very overcast mid-evening scene which only added to the feeling of loneliness – one could almost sense a gathering of st.kildans in the air grieving and burying their loved ones. Leaving this place I wandered into the ruined houses under original low wooden door-frames that were still in place. I tried to imagine what life was like – in today’s modern society I could not even come close to appreciate the hardship endured by these people. Spending some time in the museum looking at all of the bye-gone relics – a wooden carved boat which the st.kildans used to set adrift with their mail to many old black and white photographs of villagers in the early part of this century sitting backs towards the village house walls in the spot where I had just walked. I headed back to the jetty passing the village gun neatly painted black and pointed out towards the sea .I joined the others at the jetty then it was back to CUMA for the second nights sleep.The CUMA had all of home's comforts but I must say having a shower was an experience with the boat rocking to and fro , trying to keep one's balance with very little to hang on to in a confined space - but I managed!! We all enjoyed a hearty meal cooked by Kathy and expertly delivered to the table by Tabby - we were all now recovered from our ordeal of the crossing from Lewis earlier that day…. The next day the forecast was not good and dawn broke to a dull and misty view of the village – the top of Conachair was hidden in low cloud and mist this Monday morning in June. The forecast indicated that a storm was on it’s way later that night. Murdo suggested a short trip ashore before the swell increased to prevent safe return and all of the party except me were dropped off at the village. I decided to stay aboard as the weather was not conducive to producing good photos. I was glad I had, as very quickly the weather deteriorated. Murdo recalled the party from shore after about 2 hours and I watched from the window on CUMA as they approached. The swell was about 6 – 8 feet but with a bit of nimble footwork all made it back on-board if somewhat wet!! The rest of that day was spent rocking from side to side on CUMA – no way could we approach the jetty again safely and Murdo stowed away the dinghy on the roof – this looked a pretty hazardous operation to me in the strengthening winds and rain!! Views through the gap between the dun and hirta were dramatic to say the least with mist and spray reaching high up the far cliffside. Sheltered in the bay, dusk fell as the storm really took hold. It was the early hours of Tuesday morning that the storm peaked. I had tried to sleep but found the constant rocking motion and loud noise from the anchor chain rattling against the side of CUMA plus the rain on the deck and general buffeting a few inches from my face as I lay in the bunk rather alarming. Several times I went up top and looked out across a bleak bay seascape amidst rain and gusting winds. Every now and then an extreme gust threw CUMA to one side more than normal – thank goodness I had now got my sea-legs! There was another much larger vessel anchored on a buoy some 200 yards away – I could see dim lights in the distance as this vessel too bobbed around like a cork in an eerie twilight – it never really got completely dark at this time of the year. In the end I sat in the cabin keeping a watchful eye outside in the bay. The storm actually peaked at about 4.00 am. It was later confirmed that this was of force 12 hurricane strength – I was glad of the protection afforded by the "dun". The rocky outcrop " Levenish" about 2 miles to the south east of Village Bay is just under 200 feet in height. The waves were rising up about 1/3rd of this height. I later found out in conversation with the Warden that this was an "immense summer storm" with winds gusting to 100mph on Conachair – however, the maximum recorded wind speed ever was nearer to 200mph and in fact in the winter it was not unusual for waves to crash right over levenish! Tuesday was spent on the CUMA as the swell was too great to risk a landing at the jetty – reading books from the St.kilda library to pass the time. I must admit however , I found it very frustrating being in Village Bay but not being able to go ashore and explore. We had one more full day on Wednesday with the voyage home on Thursday. Wednesday dawned in far more calmer conditions and whilst not "sunny" we made plans to go ashore. We all landed at the jetty and set out in different directions. I decided to walk up the army access road to the top of conachair - keen to get to the highest point on the island - but on reflection I should have gone via the "gap". En-route a supply helicopter landed briefly by the beach dropping off supplies and personnel. I took several photographs of the view over the large beach boulders and the dun beyond. As I walked to the top of Conachair the weather improved to a mix of blue skies and light cloud. Whilst crossing from Mullach Mor to Conachair I came across several great skua’s or bonxie’s or rather they came across me – repeatedly dive bombing me – a rather unsettling experience for a novice!! With my head in " swivel" mode I made my way over to the Ordnance Survey Marker at the summit of Conachair. Here the views down towards village bay were magnificent – just as I had imagined. The rolling hills on one side and the steep cliff on the other. Still under attack from Great Skua’s, I could make out Sabine and Euan down below – tiny figures walking up from the gap amidst the many sea-birds flying overhead. The view towards Boreray and the Stacs from some 4 miles in relatively clear conditions was stupendous. Having a spot of lunch at this special and most remote place was something to be remembered. Making my way across the bonxie breeding grounds to Mullach Mor the view across Glen Bay and on to Soay lay before me. Glen Bay is enclosed by a western peninsula The Cambir, and high cliffs covered with nesting seabirds. On the east side at Gob na h-Airde the sea tumbles through a large deep tunnel which penetrates the rock and frames Boreray beyond. At low tide access is possible into this tunnel by the careful explorer. The steep walk down to glen bay seemed to take forever. Here there is a ruin called the Amazon's House and complexes of small chambers similar to Iron Age settlements. I crossed the stream and met up with Murdo, Tabby and Euan and we headed up towards the Cambir past Mullach Bi. Several more visitors were met en-route and it fact it became almost " busy"!! Arriving at the Cambir revealed a long drop to the sea below , thousands of sea-birds – puffins, fulmar, gannets etc all soaring and squawking around us with the view to Soay in front. The soaring cliffs which surround Soay afford nest space for many thousands of gannet, fulmar, storm petrel, Manx shearwater, razorbill, great skua, and Leach's petrel although larger numbers of the latter bird nest on the Cambir. Walking back across the Cambir grass, kept short by the soay sheep of which there were quite a few and running the gauntlet of the bonxies yet again brought me back to the cliff’s edge where I watched a puffin flying back and forth its winds flapping furiously in a rather un- gamely manner. We skirted the East escarpment of Mullach Bi and I watched the fulmar soaring a few feet away as they returned to their nests. I had been concerned of their oil spitting habits but should not have worried as they seemed to be very gentle birds.The far side of Mullach Bi facing the sea is like a cataclysmic land-slip with an abrupt drop from the summit to the sea. Close to the highest point is the Lover's stone where there is a terrifying drop on to the rocks in the surf far below. It was at this point that Euan had his picture taken on the "lovers stone". Euan did not follow these instructions to the letter and the words " quick, take the bloody shot" come to mind!!! Walking wearily onwards in bright warm sunshine brought us back to the top of the army road leading down to the village. Murdo suggested that I made the detour over Ruaival pass the gap with the dun which I did. Taking a few more photos of the dun and village bay, avoiding the attacks of an angry oyster catcher, I made my way back to the village and the "Puff-Inn" where refreshments were long overdue - 2 pints and two mars bars were swiftly consumed to replenish energy levels once more after a long days walk made harder due to the lack of exercise the preceeding days on the CUMA. Having a few drinks and signing our names on the ceiling was mandatory - part of the custom of enjoying the hospitality of the Puff-inn. I had finally managed to see most of the island in a day, a day blessed with sunshine , making the waiting over the previous couple of days 100% worthwhile. That evening was spent in the "puff-inn" until the early hours with a mix of natural twilight and moonlight guiding us back the short distance across the bay to the CUMA. Next day dawned and the weather was even better!! - but we had to head back to Lewis – this time under ideal conditions. 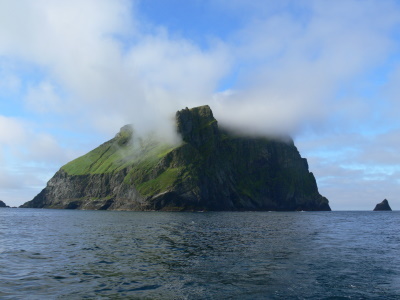 Murdo took us right around Hirta in a clockwise direction past Soay – views from the sea were very different , revealing black jagged cliff’s to the North and West sides of Hirta in contrast to the rolling landscape on the far side of the island to which we had all grown accustomed. Leaving Hirta we circled Boreray and the Stacs for the last time bathed in sunshine with sea-birds filling the air. A supply vessel nearby was swamped by a flock of mainly gannets scavenging for food. Turning Eastwards towards the mainland, St.Kilda faded on the horizon punctuated by flights of gannets travelling to and fro. As the image slowly faded, I basked in the warm summer sunshine on the deck of the CUMA as we headed for home. This was a fitting end to my visit to St.Kilda. We made the mainland late afternoon and anchored off Scarp once again. Murdo took us ashore for a couple of hours spent wandering through the old deserted village in warm sunshine. This is a lovely place with blankets of flowers on the rough grass and white sandy beaches. Later that evening I spotted 2 dolphins ( or porpoise) in the bay. The sun set to colours of purple and orange, all was at peace again. Next morning we re- traced our route back to West Loch Roag once again back to overcast conditions - well it is summer in Scotland I thought!!!. That was the end of a most memorable trip and my thanks go to Murdo, Kathy and Tabby for taking us there safely and looking after us for the duration. Dry Stone Construction: From the evaluation document "The most common traditional structure on St. Kilda is the cleit, of which about 1260 have been recorded on Hirta, distributed all over the island, and more than 170 others on the outlying islands and stacs. Cleits are small drystone structures of round-ended rectilinear form, with drystone walls and a roof of slabs covered with earth and turf." Neolithic age: "Recently, the first direct evidence of earlier Neolithic settlement emerged?shards of pottery of the Hebridean ware style, found to the east of the village." Hunting or harvesting of Birds: The collection of Gannets and their eggs was a significant aspect of St Kildan culture and economy. Paleocene: Created as part of the British Tertiary Volcanic province during the volcanic activity of the Palaeocene and early Eocene (c63-52Ma) which accompanied the early stages of the opening of the N Atlantic.